Snrky: What if I think this is all fake? What if I think this is all fake? You know. When I do the whole cartoon without spellchecking, I feel right idiotic. 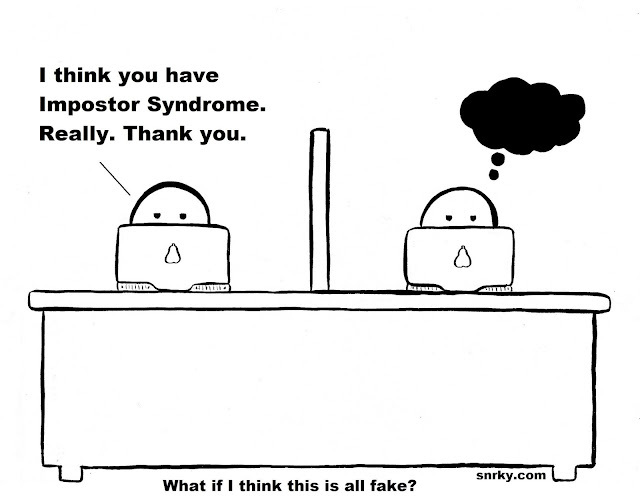 My own impostor syndrome. Four years of an English Degree. A writing masters with a big gap on a slow burn, and I can't spell impostor? I should have left it with the e just to punish myself. "I feel like a fake"
Snarky: I think you have Impostor Syndrome. Really. Thank you. Title: What if I think this is all fake?